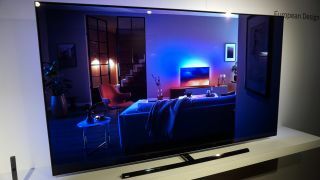 Philips TVs had a stellar 2018, boosting the company’s Ambilight line with quality LCDs and one of the best OLED televisions we’ve ever seen, the Philips OLED+ 903. Facing stiff competition this year from the Panasonic GZ2000 and LG’s barmy rollable TV, will Philips have enough to entice with its 2019 range as it looks to maintain its frontrunner position among the pack? With Philips having skipped out on CES 2018 in favor of its own international showcase, we’ve now seen a good chunk of what the company has planned for its range of 2019 TVs – or at least up until the summer schedule for its releases, after which it’ll be prepping an all-new flagship successor to the showstopping OLED+ 903 in time for IFA 2019 in the fall. Read on for all the details on Philips 2019 TV range so far. For the time being, there are no firm release dates or pricing information to share on the forthcoming Philips TV sets, so expect to see them land at some point around May. Philips also has more TVs due later this year – we'll be updating this post as soon as they're announced. While the likes of LG, Samsung, Sony and Vizio have doubled down on third-party content support for this year’s TV range with newly-acquired compatibility with Apple’s AirPlay 2 and HomeKit smart home standards, Philips is focussing on core picture and audio quality for its 2019 range. While the majority of the company’s top-flight TVs will be running Android TV and have voice-control support for Google Assistant and Amazon’s Alexa, it’s with the third-generation P5 Pro image processing engine where it’s making the biggest changes. Before we get to that though, some key specs to note: almost the entirety of Philips 2019 line-up supports all the major HDR formats (HDR10+, HLG and Dolby Vision), as well as having support for Dolby Atmos overhead surround standards (down-mixed for onboard speakers). Philips' new P5 third generation processor will go beyond its predecessor in a number of key ways. The Perfect Natural Reality tool will improve skin tones, a revised Detail Enhancer will tweak its Detail meter to remove jaggy edges on over-processed SD upscaled imagery, an Improved Digital Noise Reduction system will ensure “mosquito” distortion won’t occur predominantly in detail-heavy footage – in other words, you’ll be able to see the trees for the wood. HDR quality will be improved too, ensuring that dark scenes are not only dark, but full of detail in the shadows, too. Likewise, you’ll see less color clipping in bright scenes – a summer’s sky will retain its blue hues, rather than being a washed out flash of white light. Philips has also worked on its first-party audio systems, boosting the mid-range and widening the soundstage for its 2019 models in order to better take advantage of new support for Dolby Atmos mixes. But its with the Philips 8804 LCD where you’re most likely to want to listen in – it’s taking a leaf out of last year’s Philips OLED+ 903 screen and including a Bowers and Wilkins soundbar. More on that later. While we await a true successor to the Philips OLED+ 903, we’re looking forward to spending more time with the Philips OLED 854 and OLED 804 screens. Identical apart from stand differences (the 854 centrally mounted, the other with a pair of legs) these 4K screens will be available in 55 and 65-inch sizes. They’re very similar to last year’s Philips OLED+ 903, except with one key omission – they lack the impressive Bowers and Wilkins sound system, opting for a Philips-own build instead. Running Android TV, working with Alexa and Google Assistant and with all four of their HDMI ports HDR-ready, these Ambilight screens will be ones to watch for those looking top-notch OLED visuals. For a deeper look at these screens, read our hands on: Philips OLED 804 / OLED 854 review. Though OLED TVs have become Philips’ showstoppers, the majority of its range still consists of LCD TVs. Though LCD can lack the richness of a well-tuned OLED TV, they shouldn’t be sniffed at in their own right – Philips has done some stellar work not only in the picture stakes, but also with audio, thanks to a partnership with Bowers and Wilkins. First up then, the Philips 8804 – one of the most promising LCD screens we’ve seen in a while. It’s 4K visuals will be available in 50, 55 and 65-inch sizes, and will have the full house of HDR10+, HLG and Dolby Vision support, as well as Dolby Atmos sound. It’s also the only screen revealed so far this year from Philips to include that show-stopping Bowers and Wilkins sound system again. For more info, read our hands on Philips 8804 TV review. If style is more important than sound quality, check out the Philips 9104. It’s another 4K LCD panel, but has been designed in conjunction with design house Georg Jensen, and has striking chrome finish aluminium feet. It too has standard HDR support covered but drops HDR10+ and Dolby Vision, only features Dolby Atmos audio passthrough, and will only come in a single 55-inch screen size. It has a three sided Ambilight though, so this may be one to check out for its aesthetic value. Next up is the TV Philips is pushing most heavily for this half of the year – the Philips 7304 Performance Series, which they’re nicknaming ‘The One’. Why? Because it’s ‘the one’ TV they think will suit most people, ticking lots spec boxes will aiming to come in at a mid-range price point. The Ambilight 4K LCD screen will come in a range of size – 43, to, 55, 58, 65 and 70-inches – has the full suite of HDR options and features Dolby Atmos. For more information, check out our Philips The One first look impressions. The Philips 7504 looks set to be a similar screen, coming in 50 and 55-inch screen sizes, trading a less striking stand for beefier 25W 2.1 built in speakers. The One only has two-channel 20W speakers. From here down the range of LCD Philips TVs, you lose access to the top-notch P5 image processing engine, instead being left with the Pixel Precise Ultra HD processing engine. They also run the SAPHI operating system, rather than the more versatile Android TV. So, the Philips 6814 will come in 43, 50, 55 and 65-inch sizes, the 6704 in 43, 50, 55, 65 and 70 inches, and the 6504 in 43, 50, 58 and 65 inch sizes. The key differences here? The 6814 has a T-Bar centrally-mounted light finish stand with 3-sided Ambilight, while the 6704 has Ambilight, a dark frame finish and two feet supporting it. The 6504 looks pretty much the same as the 6704, but doesn’t have any Ambilight features. It says a lot about the dominance of 4K TV now that, not only is there only a single non-4K TV in Philips range this year, but it’s not even 1080p – just a 24-inch HD-ready 1366x768 screen. The Philips 4304 has no smart features, no HDR, and only two HDMI port ports. This is very much one for the kitchen, or a “my first TV” for the kids’ bedrooms. Best soundbars 2019: what soundbar to go with it?